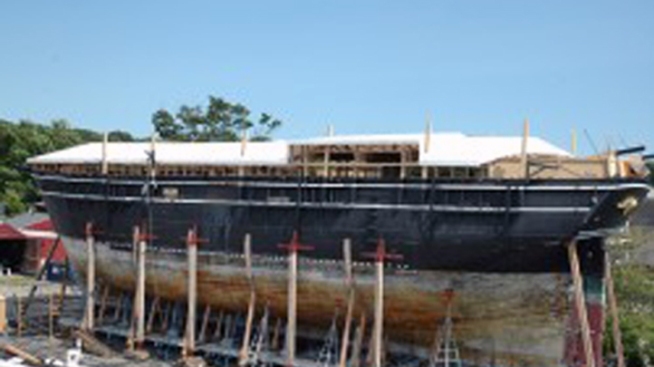 Wood from Auburn University could go to restore the Charles W. Morgan. The trees poisoned in a bizarre case of football rivalry could benefit an old whaling ship in Connecticut if attempts to save them fail. Harvey Updyke Jr. – an Alabama fan -- is accused of poisoning two oak trees at Auburn University’s Toomer’s Corner because of the team’s football rivalry. It was at those two 130-year-old oak trees at Auburn that fans celebrate victories, the Day of New London reports. The story has gained headlines and brought students and fans of the two rival schools together. But, what remains uncertain is the fate of those two trees. Auburn is trying to save them, the Day reports, but if those attempts are not successful, the trees could go to Mystic Seaport and the wood would be used toward restoring the ship, Charles W. Morgan, the Day reports. The boat is the last surviving wooden whaling ship. Quentin Snediker, the seaport shipyard director, works with people throughout the southeastern United States who help him locate wood for the project, the Day reports, and he is hopeful Mystic could obtain the trees if they cannot be saved. The museum has received oak trees that succumbed to Hurricane Katrina and some other storms along the Gulf Coast for restoration efforts, the Day reports.